Throughout Australia, increasing numbers of children are suffering serious injury and, in some cases, fatality as a result of falling from windows or balconies. In fact, an average of fifty children a year will fall from an elevated part of their home and suffer serious injury as a consequence. There are a few things that can be done to address the important issue of child safety, and there are even laws in place designed to protect children from the dangers of high windows or balconies. In Queensland, it is a legal requirement that homeowners install balustrading on balconies, decks or patios with a drop of one metre or more. This law has drastically improved child safety across the board, however it fails to address the risks associated with other dangers throughout the home, of a similar nature. One such danger is windows. Queensland is home to quite a large number of multi-storey homes and naturally, these homes have windows on their upper levels. It might not seem like such a risk at first, but there is data to suggest that your home’s windows actually pose a credible threat to the safety of your children. Although balustrades are unsuitable for installation on windows, you still have a few options remaining. Perhaps the most effective of these options are child safety screens. Child safety screens range in the specific nature of their construction, however almost all are constructed from aluminium or steel. They are strong, durable and can be made to fit perfectly on the windows of all homes. With a child safety screen, your child will be unable to fall from the windows in your home, so you get the peace of mind that comes with knowing your child is safe. There is some debate surrounding possible solutions for the issue of child safety around the house. There is a lot of support for the education of children when it comes to matter of safety around the home. Safe behaviour is something that should always be encouraged for children, which is something that both schools and parents model. Children however, are naturally curious and education is not always as easy as it sounds. Children between the ages of one and five are at highest risk of falling from a window or balcony and it is particularly hard to educate children of such a young age, about the dangers of heights and playing in windows. Even when your windows are closed, there is still some potential for an accident to happen, but with child safety screens, this risk is eliminated. Brisbane is famous for its hot summers and most homes in the region are constructed with this in mind. As a result, many homes in the area have a large number of windows and it is not uncommon for homeowners to leave these open during the hotter months. This is a great way to maintain a comfortable living space, without spending a fortune on electricity, although it does leave inquisitive children at risk of falling. Not all homes have air conditioning, which means that closing your windows is not always comfortable or practical. Even with air conditioning, the costs associated with prolonged air conditioner use can be too high for some. 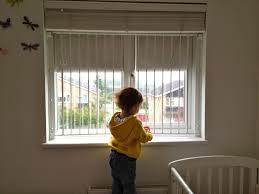 Fortunately, child safety screens for windows are a great solution. Child safety screens allow for free air circulation, while serving as a strong and durable barrier between your child and the window. This provides you with the best of both worlds, as you get cool breezes and the knowledge that your child is completely safe. The main reason that child safety screens for windows are so important is that accidents happen. It is not uncommon for children to do things that we might see as risky, which is why we have to take extra precautions to ensure their safety. Even with the window closed, there is still some degree of risk associated with upper-level windows. Not all homes have windows with modern safety glass and, in fact, some of Brisbane older homes are likely to have older glass that can sometimes be quite fragile. The only way to truly guarantee your child’s safety, when it comes to elevated windows, is with a good quality child safety screen. When you think of security screens for windows, thick metal bars are probably what come to mind. We have all seen homes or buildings with thick metal bars installed to their exteriors and while this offers great security, it does not always look great. This is something that turns many homeowners off the idea of security screens, but fortunately child safety screens are different. Child safety screens for windows are available in a range of designs and the best of these are generally diamond or Crimsafe style screens. Both are low-impact, non-intrusive installations that can sometimes even complement the appearance of your home. This gives you the combined benefits of great protection and good looks. It is easy to get caught up in the more obvious safety threats around your home, and this means that the little things like window safety are overlooked. Well-publicized home safety installations such as pool fences and balustrades can easily take precedence at the expense of child safety screens. In reality however, these issues are of equal importance and can sometimes mean the difference between life and death. There are so many things that can go wrong when dealing with heights, windows and children, which is why that extra degree of care is necessary. Your home’s interior is where you and your family should feel most safe and this feeling of safety is just as dependent on interior security as it is on exterior security. With child safety screens, you get two-way security: your child cannot fall out the window and no unwanted guests can get in. This gives you security like never before and guarantees your child’s safety better than many other security installations. To know more about the highest quality child proof safety screens in Brisbane, get in touch with Vincent Security today on (07) 3849 4555.